Joseph Kahn directs the upcoming movie, produced by the rapper also known as Marshall Mathers. Bodied is a film about the world of battle rap directed by music video specialist Joseph Kahn and produced by Eminem, and is available on YouTube Premium on November 28. Today, you can watch a new red band trailer for the film via Complex. Bodied stars Calum Worthy, Dumbfoundead, Anthony Michael Hall, Jackie Long, Charlamagne Tha God, and more. The film won the People's Choice Midnight Madness Award at the 2017 Toronto International Film Festival. 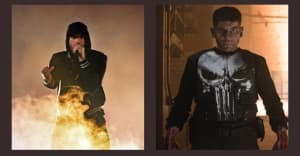 While not strictly battle rap, Eminem's Machine Gun Kelly diss track "KILLSHOT" enjoyed a No. 3 debut on the Billboard Hot 100. He released his surprise album Kamikaze on August 31, and it debuted at No. 1.